This February, right on time, Liebherr-Werk Ehingen GmbH delivered the first of 71 protected mobile and recovery cranes to the Bundeswehr under a major procurement contract. In June 2017 the Federal Office for Bundeswehr Equipment, Information Technology and In-Service Support, or BAAINBw, awarded Liebherr the order, which is worth around €150 million. Broadly based on the company's four-axle mobile crane chassis, Liebherr's G-BKF is a protected recovery crane vehicle. Highly manoeuvrable, it performs extremely well even in the toughest terrain. Two recovery winches and a wheel lift mounted on the rear of the vehicle make the G-BKF the perfect system for recovering and towing a wide variety of vehicles, including (for example) the German Army's new generation of Protected Command and Functional Vehicles (GFF), the Protected Mobility Logistic Support Vehicle (GTF), MULTI FSA swap body trucks as well as a variety of legacy wheeled vehicles – with no need for the crew to leave the safety of the protected driver or crane cabs. The G-BKF can be equipped for recovering vehicles as well as for lifting heavy loads, making it a flexible and economical choice. Sporting a 20.9-metre-long telescopic boom, the G-BKF handles loads weighing up to 20 tonnes quickly and with great precision. Similar in design to the standard civilian model, the G-LTM ordered by Germany's Bundeswehr is a four-axle mobile crane with a protected driver's cab and protected crane cab. Incorporating the latest chassis and engine technology, it performs superbly in all types of terrain. A six-cylinder, 330 kW Liebherr diesel engine with maximum torque of 2,335 Nm gives the G-LTM the power it needs to get the job done. The Bundeswehr order includes 17 vehicles with a counterweight of 8.4 tonnes, referring to these as "Heavy Mobile Crane Vehicles"; featuring a counterweight of 22.5 tonnes, the remaining 21 vehicles are known as "Super Heavy Mobile Cranes". During the tendering process, BAAINBw focused squarely on the need to protect the crew. 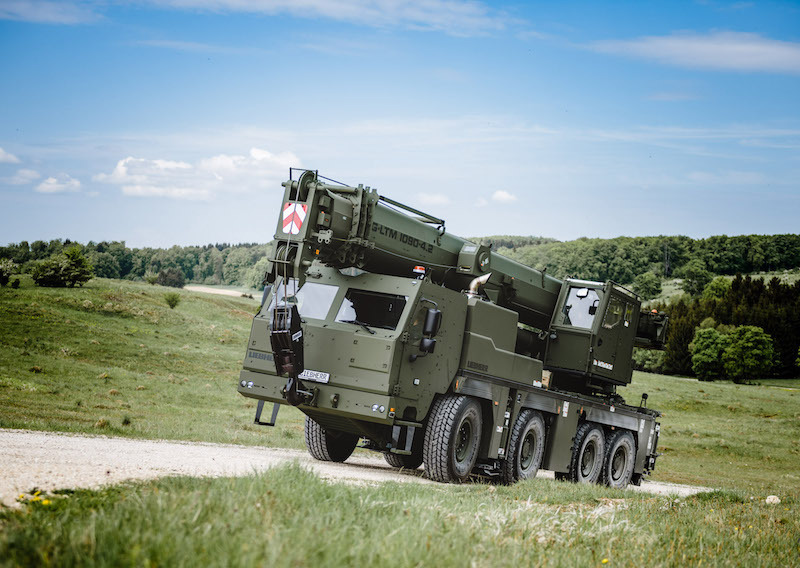 In order to meet these stringent criteria, Liebherr-Werk Ehingen GmbH worked together with Rheinmetall, Europe's foremost maker of army systems, placing it in charge of the protected driver's cab and protected crane cab. The Rheinmetall-made driver's cab protects the crew from ballistic fire as well as from landmines and improvised explosive devices, while a filtration system keeps the occupants safe from nuclear, bacteriological and chemical agents. The upper cab, likewise produced by Rheinmetall, protects the crane operator from ballistic threats during crane operations. In both the G-LTM and G-BKF, the cabs are identical.